On March 31, 2014, the landmark Right to Free & Compulsory Education (RTE) Act that ensures free and compulsory education for children in the age group 6-14 years (enacted on April 1, 2010) completed its four years of enactment, however, the country currently in a high voltage election mode for electing its 16th Lok Sabha, heard little on its 4th year-end progress at least from the government. 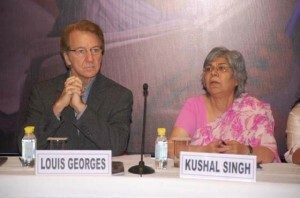 AT A MEDIA ROUND TABLE ON progress and challenges of RTE organized by UNICEF India in New Delhi on April 15, Kushal Singh, chairperson of the national commission for protection of child rights (NCPCR), the agency responsible for monitoring RTE implementation, while highlighting achievements admitted that running a system where 20 crore children are enrolled in over 11,53000 elementary schools is not easy. “Panchayat education committees and school monitoring committees need to be integrated for local monitoring, which in commission’s opinion is the best supervision for effective adherence to the rules under the Act, “ she said. At the same event, Louis Geogres, representative UNICEF India said that time has come to shift focus from access to right to learn. UNICEF has been supporting the Government of India and states in the implementation of Activity Based Learning (ABL) to reduce learning gaps, social barriers and discrimination. Moving away from rote based learning, this innovative child centered pedagogy is now being practiced in 250,000 primary schools across the country. Evidence demonstrates major improvement in academic and co-curricular outcomes as claimed by the UNICEF. Meanwhile the chorus demanding inclusion of early childhood education (ECE) or preschooling and secondary education is growing with virtually every advocacy group from RTE Forum to UNICEF and NCPCR lending its support. At a national stocktaking convention of the RTE on March 13, RTE Forum, a network of over 10,000 organizations and activists raised a demand for extending the right to the birth of child. Citing empirical evidence in favour of extending the right to other extremity upto 18 years of age, activists said, such an action can help prevent early marriage of girls and spread secondary education, which is critical for development of the nation. In this regard, UNICEF celebrity advocate Kareena Kapoor who recently visited adolescent girls in Kasturba Gandhi Balika Vidyalaya in Rajasthan in a video message released by UNICEF says that there needs to be a considerable thought about education at the secondary level, especially for adolescent girls above 14 years of age, for whom, being in a school is crucial from many stand points…. to be in a protected space, to prevent early marriage and hence early pregnancy, to develop. According to Prof Manoranjan Mohanty of Council for Social Development, of the five rights legislations of the UPA government only RTE is a right that has potential of affecting lives and building society, others are just relief measures. “Affirmative actions of the last 25 years will come to naught if we fail to implement right to good education.” Prof Praveen Jha, economist at JNU fails to understand the vast diversity of schools based on unit cost allocations within government sector and feels only common school system can provide a solution. Saying that right to education should flow from right to life itself, Dr Niranjan Aradhya, National Law School University, Bangalore said that education shouldn’t be seen in isolation and situation on ground can’t be changed unless there is a political will as ‘you need a lot of money and resources’. Even though all states and UTs have notified rules and authority under the RTE by its 4th year end, yet the situation on ground remains dismal. For instance Section 12(1)(c) of RTE which provides for 25% reservation in private schools for economically weaker sections and holds a potential of creating massive 10 million seats in next five years in a country where most people including poor aspire for private school education (ASER report 2013 results project that by 2018, 50% of Indian children will be in private Schools), the implementation is tardy. A study conducted by Delhi-based Indus Action, a non-profit group headed by Teacher for India city director Tarun Cherukuri, with support from Centre Square Foundation, a venture philanthropy fund, on 352 families in Meethapur and Maidangarhi anganwadi hubs in south Delhi covering 19 angandwadi centres found that 98% of the parents mentioned they did not apply for a private school for their child in the previous cycle (2013-14) due to lack of awareness, documentation barriers and other hurdles. It may be mentioned that the reservation for EWS in Delhi started in 2004 much before it was mandated under RTE in 2009, and if Delhi with 35000 seats can have such a ground reality with so much experience in the area, the situation in rest of the country is only imaginable. Under the project Eklavya, Indus Action started a campaign of generating door to door awareness and also facilitating admissions by volunteering, is showing significant impact. “By April 2014, 70% of the respondents now felt that private school education would benet their children. They preferred private schools over government schools. All the families shared that they would like to change the school of their wards if given an opportunity where in they are not required to pay the fees,”says a report released on the project. “ It took almost 30 years for chartered school chains in USA to create two million seats and here we’re talking about 10 million seats, a big opportunity for philanthropic and CSR investment. From experience and knowhow of this project, more people can be trained and the process can be speeded up,” feels Ashish Dhawan, CEO of Central Square Foundation. On similar lines IIM-Ahmadabad has created an RTE Resource Centre wherein eligible children are helped to take benefit and entitlements under the Act. “We see an opportunity in transforming the perception from disenchantment to engagement and would like to open chapters in other places,” says Prof Ankur Sarin, faculty public systems group, IIM-A. A way out for increasing enrolment under Section 12(1)(c) could be doing away with cumbersome documentation and substitute it with self-declarations as is done in case of private healthcare facilities in Delhi according to Ashok Agarwal, the activist lawyer credited with staring judicial activism for reservation for EWS in Delhi. “Schools must accept inclusion, stand for this value system and make it visible in their admission notices. Issues about integration in classrooms or effect on the diversity of classrooms by such inclusion is a myth and in our experience whatever minor things are encountered initially can be tackled with a good intent and empathy and teacher involvement. Children don’t recognize distinction and instead mingle and get along easily,” says Ashok Pandey, principal Ahlcon International School, Delhi. Quite clearly as the RTE prepares itself for the second important milestone of trained teachers next year, the lessons from ground must be learnt as quickly as possible for moving to course corrections etc.